In certain cases, you might also want to offer the option of a Bank Transfer to your guest. Just keep in mind that accepting bank transfers can cause a lot of manual work and double checking that all payments have been received and refunded. For example, with bank transfers, it is not possible to schedule automatic subsequent payments or make automatic refunds, this is only possible with credit cards payments. Select the option Accept payments by bank transfer and fill all the required information. 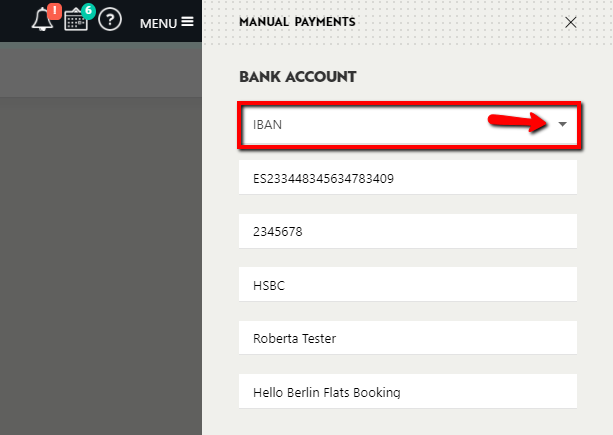 If your bank account does not support an IBAN format, choose Other Bank Account from the drop-down menu. 💡 Note: Your bank details will only be shared with the guests at the checkout page and via email once they have confirmed the booking.